Josh and I found out we were pregnant with Anniston on our one year engagement anniversary (about 2 months before we got married) - the pregnancy was unplanned but we were both excited and felt blessed to have been able to conceive so quickly. During my pregnancy I had a subchronic hemorrhage in the beginning which lead to extra ultrasounds, which all said baby was normal! Around 32 weeks I was diagnosed with pre-eclampsia and Anniston was diagnosed with IUGR (intrauterine growth restricted) which meant she was measuring small. I went in weekly until 37 weeks to get ultrasounds and BPP tests and she was gaining weight and looked great! After a failed induction and a "planned" emergency c-section, Anniston Autumn was born on March 16, 2017. She was 5lbs10oz 19 inches long and was doing great on her own and didn't require any NICU time. Once we were home with Anniston, she had slight jaundice and slept a lot for the first few weeks but then it was apparent that Anniston had some other issues. She projectile vomited numerous times and also was a nightmare to get to sleep, so we ended up at my parent’s house most nights so she could get passed around from my mom and two of my sisters in order for her to fall asleep. Her pediatrician said it was colic and also acid reflux and prescribed Zantac which only made her projectile more often, so we stopped. Around a month old, she started what we assumed was her laugh but then it normally was accompanied by a crying noise. Most people who heard Anniston thought it was cute and asked if it was a cry or a laugh and honestly, I had no clue - we figured it was from gas. 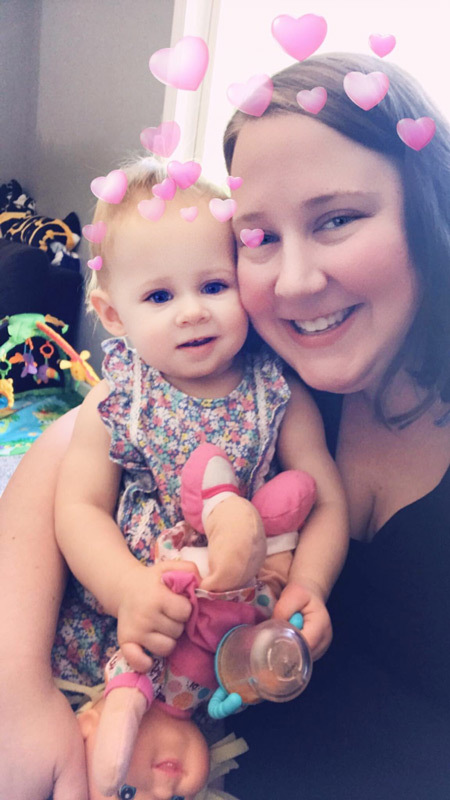 We switched Anniston's pediatrician around 5 months old because it seemed like we weren't getting the best care for her, and our concerns were being ignored. I always thought she had a milk-protein allergy but no one (not even our new pediatrician) would test her because she was gaining weight and didn't have any other typical signs. We dealt with her having constipation since early on and switched her formula three times before we ended up just giving her a few ounces of pear juice daily. Starting solids didn't seem to work well since the first time we tried oatmeal she screamed for 24 hours straight - looking back on it now, I believe she was having seizures all day long. I got into a routine with Anniston which seemed to work well for getting her to sleep but it required a lot of patting, shushing, song playing, rocking - you name it, we did it. Anniston was slightly delayed on some milestones such as sitting up and crawling but her doctor chalked it up to being a few weeks early and Anniston didn't take too long to accomplish what she needed to draw any concern. When she started teething around 7 months old, I would have to rock her for hours on end in order for her to go to sleep. We also would hear her "laugh" for 20-30 seconds every 5-10 minutes on the monitor and I truly thought it was from teething pain or she was playing with her blankie or crib toy and went back to sleep. We were so frustrated that she could put herself back to sleep after these giggling episodes but wouldn't dare be put down for bedtime unless she was in a deep sleep. 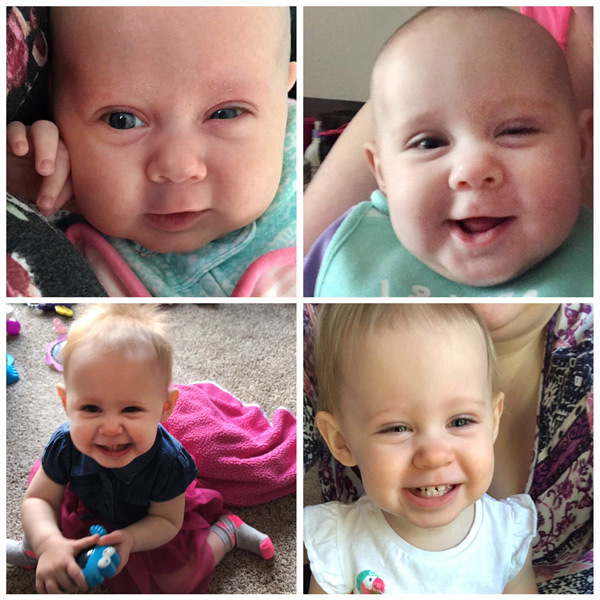 Fast forward to her 9 month appointment and I brought up these giggling/crying episodes because I noticed she would do it while I was rocking her to sleep and she seemed to pass gas during it and her doctor stated it was probably just behavioral because it makes her feel funny and not to worry. Shortly before her first birthday, we were preparing to have her baby brother (two weeks after she turned one), I called Children's Hospital of Wisconsin and scheduled her an appointment with the Reflux/Constipation Clinic because I just knew something wasn't right. The first they would squeeze her in was May 22nd. I was annoyed but hopeful that they would get this figured out for her. March 30, 2018 we left Anniston with her grandmother while we went to the hospital to have her brother, Abram. She slept ok for her but was still a pain to put to sleep and same for the second night which she spent with two of my sisters. She threw up around bedtime (which has become a common problem if she gets too afraid at night) and my sister had to walk up and down the hall with her for her to sleep. Since then she has only been put to sleep by others aside from me maybe five times. She won't even let her dad, Josh, rock her to sleep. The second week after Abram was born my little sister, Krystal, was helping me out with the kids. Anniston was having hundreds of these laughing/crying burst of energy episodes daily. My sister couldn't sleep one night and began googling her symptoms and came across HH. She told me the next day not to freak out but what if it was a brain tumor Anniston had, and I shot her down saying that makes no sense. I had googled her symptoms before and nothing made sense but I ended up looking up videos and information and it became very clear this was what Anniston had. (I also read Kaitlyn’s story and everything seemed so familiar and made me believe even more this was what Anniston was suffering with.) Instead of calling her pediatrician for a referral, I called Children’s Hospital directly and they fit her in to see a PAC on April 19th. This appointment seemed like it was going well, she listened to my concerns and asked some questions and even saw a video of one of Anniston's episodes and then she asked to be excused to grab a neurologist. When they both came back in he was friendly and said that Anniston didn't look like there was anything wrong with her and he has never seen gelastic seizures in someone as young as her but he'd order a sleep deprived EEG just to appease me. 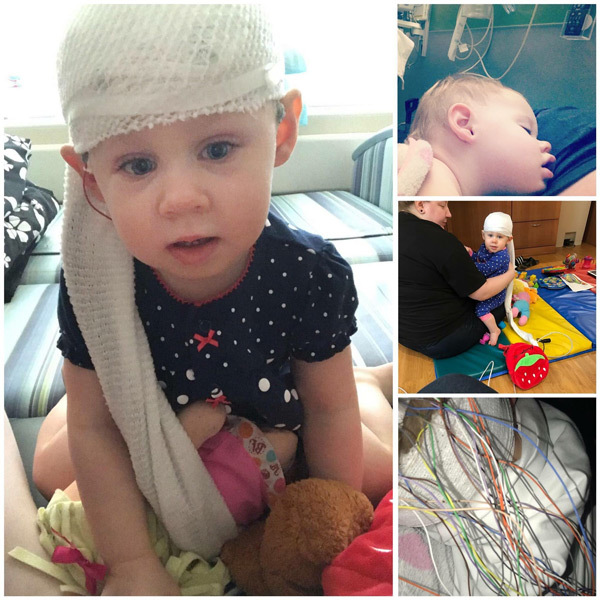 Anniston had the EEG on May 4 and I was told it could take two weeks for results but later that day I had an automated message that said "there is no component information for this result" and so I waited for a call. Almost two weeks later I hadn’t heard anything and so I reached out and was told that there was nothing found on the EEG and basically good luck because they don't think any other testing was necessary, even though I asked for an MRI. Thankfully I was able to get a name of a nurse to call to switch to a different neurologist who agreed to see Anniston immediately and he wasn't completely on board that she had HH or gelastic seizures but wanted an MRI and overnight EEG to be sure. The end of June, Anniston had her sedated MRI and the following week an attempt at an overnight EEG (which we didn't stay for because she threw up from the anxiety she has at bedtime from not being home). While we were attempting the EEG, I was told by the nurse that she did have HH (never received a call from the doc) and was told her doctor was out on paternity leave and he would call me while we were there. He suggested trying Keppra and indicated that we were required to try at least two medications prior to even discussing is surgery. At this point in time, my husband and I knew there were two other hospitals to reach out to for second opinions because they have dedicated teams who are experts on HH. Texas Children’s was the first hospital to get back to us. Within days of receiving her files, they had a meeting and indicated that Anniston should have surgery ASAP in order to give her the best chance at having a normal life. We are currently scheduled to have her surgery October 19th and we are so hopeful that this relieves her of all the seizures, anxiety and rage outbursts she is having currently. Anniston’s current neurologist in Wisconsin wasn’t very happy with the news that we did not want to wait to have Anniston try anti-seizure medication and we already were planning surgery elsewhere. He tried suggesting he would talk to the head of neurosurgery to expedite her case to get approved for surgery but almost a month later, I have yet to hear back from him. In our gut, medication wasn’t her best option when she’s having a hundred plus seizures a day at her peak. We knew that surgery would have to be done sooner rather than later. All I will say is, follow your intuition and get second opinions when you believe they will help! Anniston did also have appointments with an endocrinologist at Children’s who spent five minutes with us and said because has no breast development or pubic hair she’d see us in a year and wanted nothing to do with any sort of testing to see if she was on her way to precocious puberty. Frustrated, I waited for a phone call to schedule a neuropsychologist appointment with Children’s Hospital and they wouldn’t/couldn’t squeeze her in until January 2019. We ended up finding a doctor at Aurora who squeezed Anniston in, knowing she was having surgery, and she was testing above her age group. We will definitely update once we are post-surgery on Anniston’s progress! I want to thank Lisa Soeby for being an open ear for me and also giving me direction in handling doctors that won’t listen. Hope for HH has been such a great resource for us and I hope Anniston’s story can help other families.